This Saturday signifies the beginning of a new era for Texas A&M as the team makes its SEC debut against the 24th ranked Florida Gators in front of a sold-out crowd at Kyle Field. It also marks Kevin Sumlin’s first game as A&M’s head coach and the first time since 1967 that the Aggies will open their season against a conference opponent. Factor ESPN’s College GameDay crew into the equation, and the atmosphere in College Station will undoubtedly be electric. Not surprisingly, the average ticket to see A&M take on Florida stands at $260 on the secondary market–the most expensive conference home opener of any team in college football this season. Tickets for the sold-out game at College Station are averaging $260—a markup of 148% over their average face value of $105. Saturday’s game is currently on pace to be the Aggies’ third priciest regular season home game on record, trailing only last year’s final Lone Star Showdown game against Texas ($304 average) and this year’s highly anticipated matchup against LSU ($344 average). In comparison to the other SEC debut this weekend — that of Missouri at home against Georgia — Texas A&M – Florida tickets are going for a much higher premium on secondary markets. The average price of a ticket to UGA @ Mizzou is $172, or about $90 less than the average price for a ticket into Kyle Field this weekend. As you might expect, this game is not a typical home opener, and as such it’s also set to become the Aggies’ most expensive opener in recent memory—with tickets fetching nearly $200 or 300% more than last year’s September 4th game against interstate rival SMU and $215 more than in 2009 when A&M opened the season against Stephen F. Austin. Despite these high prices, the average price for a ticket has trended slightly down as we’ve neared gameday, meaning there’s still some hope for fans to find a decent deal on tickets. 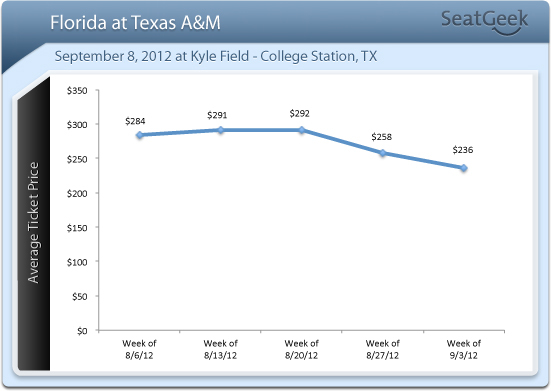 From a week-over-week perspective, ticket price averages have been trending slightly downward since August 19th. Although prices reached a 2-month high at $292 for tickets purchased in the 7-day period ending August 19th, they subsequently fell 13% to $258 the following week. Within the last 72 hours, however, prices have softened somewhat—likely the result of the game’s proximity. Since Tuesday, the average resale price for a ticket to Florida-A&M is $213 — still $100 over face, but a far better deal than the going rate for tickets a few weeks back. Currently, the most expensive ticket listing on SeatGeek is an exorbitantly priced $2,756 seat in Section 132, Row 18. Cheaper alternatives, including a ticket in Section 524, Row 11 are still selling for 60% over face value, starting at $160. We would expect ticket prices to trend slightly downward over the final days leading up to kickoff, so it is likely that fans will be able to get into upper deck Zone tickets for around $130-$140 if they wait right until that 24 hr window before kickoff to buy.